Built-in fast and accurate document conversion engine (ie: docx to pdf). Reading, cleaning, writing and converting documents in more than 100 formats, TIFF, PDF, DOCX, DICOM & JBIG2 included. OMR, OCR, MICR, Document Recognition, barcode reading and writing (linear & 2D). Color detection & MRC engine for image and PDF compression. Including .NET WinForms, WPF, ASP.NET and COM/ActiveX UserControls. All-In-One Document Imaging Toolkit With 100% Royalty-Free Client & Server Deployment! GdPicture.NET is an all-in-one toolkit for PDF, DOCX, image processing, document imaging, scanning, barcoding, printing, OCR, Forms processing, annotations and much, much more. No need to buy several products anymore, GdPicture.NET does it all! And it is 100% Royalty-Free! GdPicture Technology enables you to load, save and convert documents in over 100 raster and vector document formats. Including TIFF, PDF, DOCX, SVG, JPEG-2000, JBIG2, DICOM, GIF, JPEG, PNG, WMF, EMF, BMP, camera RAW, RAW Fax G3, ICO, PCX, PNM, HDR, Photoshop files, TARGA, JNG, EXR, DDS, PPM, SGI, PBM, PGM, PFM, XBM, XPM, KOALA, IFF, Dr. Halo files, WBMP, Kodak PhotoCD files, Sun RAS files and many others. Windows XP to Windows 10, Windows Server 2003 to 2016. 32-bit, 64-bit & AnyCpu target platform. ASP.NET WebForm, ASP.NET MVC, Windows Forms, WPF, COM/ActiveX. GdPicture.NET 13 14.0 is the first major release early 2017 of the well-known GdPicture.NET. As usual for 13 years now, the GdPicture.NET team strives to offer state of the art PDF support and document imaging technologies. 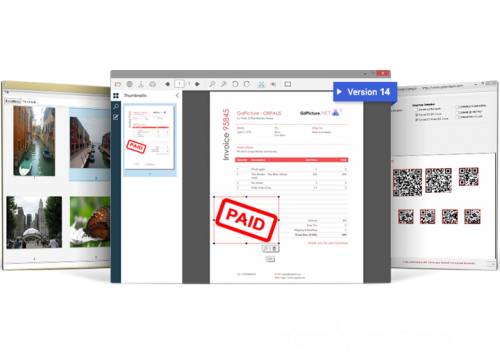 All major features have been improved: PDF, TWAIN acquisition, compression, document rendering, document conversion, barcode recognition, character recognition, and document clean-up. A new document converter engine is available (GdPictureDocumentConverter class) and a new class is provided to bring advanced OCR support for document and fields recognition (GdPictureOCR). This brand-new release also includes new or improved features for other popular document file formats, including Office Open Xml related capabilities and TIFF using Wang annotations. it also now support RTF, CUR and WSQ formats. DocuVieware, the major extension for HTML5 document management, also includes a new annotation comments snap-in, adds support for HTTPS twain scanning in all browsers, and comes with a new core that dramatically increases performances. All required resources and features to use DocuVieware through any popular web technology such as Angular, ASP.NET Core, ASP.NET, Java, jР°vascript, Node.js, and PHP, are now provided. This new version comes with a brand new and redesigned rendering engine permitting to render large bitmap very quickly, and display multipage documents in a multiple page view mode. It has been implemented into the WinForms version of the GdViewer control, for all supported Frameworks. A new class to handle fast document conversion has been added to the toolkit. It permits to quickly convert any supported document format by GdPicture (more than 100) to popular formats such as PDF and TIFF, by handling every aspect of the conversion (color space, metadata, annotations, image, textвЂ¦). (GdPicture Ultimate edition required). View rtf documents within GdViewer & DocuVieware with multipage view mode, text search, text selection & extraction and more. WSQ and ICO image files are also supported for viewing and conversion. The OCR engine has been dramatically improved to reduce memory usage, enhance stability, and increase accuracy (especially with poor quality bitmap and very large bitmap). There is also much improvement and bug fixes to better read Japanese, Hebrew, and Arabic text. GdPicture.NET 14.0 searchable PDF (PDF-OCR) creation has been improved. The creation is now faster and the produced files are smaller. The character recognition engine has been optimized to use less memory, and the PDF page recognition method has been improved to avoid wasting time on existing visible text. Rotation detection and top of the art skew-detection have been implemented to permit OCR on any kind of oriented pages automatically. PDF/A is an ISO standard for long-term archiving of electronic documents. Thanks to GdPicture.NET PDF/A capabilities, it is possible to create standardized electronic documents that can be rendered reliably over time on any system, when opened with a compliant viewer. GdPicture.NET 14.0 is able to generate any flavor of PDF/A: PDF/A -1a, PDF/A -1b, PDF/A -2a, PDF/A -2b, PDF/A -2u, PDF/A -3a, PDF/A -3b and PDF/A -3u. GdPicture.NET 14.0 comes with a new font generation engine supporting subsetting of True Type fonts when writing PDF with Unicode content. The software now supports OpenType font for Unicode text drawing. The new text extraction algorithm builds text closer to the natural reading order. GdPicture.NET is now up to 5 times faster reading a complex PDF and dramatically faster writing pdf text. GdPicture.NET produces smaller file and the compatibility with several viewers has been improved. Support for transfer functions to the PDF rasterizer. Added support for applying digital signature with Timestamp. Support for adding JPEG image to PDF without decoding / re-encoding the image. PDF packing has been improved for documents with links. Improved processing speed (and memory usage) of big documents. Printing: reduced generated spool size for some complex documents. Printing: improved quality of produced pages, especially with virtual printers. GdPicture.NET 14.0 includes a lot of improvements of the rendering engine and provides support for tables content and pictures. The rendering engine is up to 80% faster. Dramatically improved MICR engine accuracy and speed for CMC7 and E13B fonts. Improved check reader engine. The GdPicture.NET barcode reading engines use an error correction mechanism which makes the reading robust to noise caused by low image quality. An improved error correction mechanism has been introduced within GdPicture.NET 14.0 to improve the speed and accuracy of the engines. Barcodes use finder pattern to locate the code within a document. The processing of the finder pattern has been fine tuned to improve the speed and the barcode coordinates retrieved by the engines. GdPicture.NET page auto-deskew accuracy has been improved. A better correction of the skew introduced when making use of an automatic document feeder during the scan improves the legibility of the document (together with the character recognition accuracy). The accuracy of the blank page detection engine has been dramatically improved to better sort empty pages, to handle punch holes and margins. It can also now be applied on specific region of interest. The blank page detection engine can now identify margins and punch holes. Introduced a new color dropout filter to drop a specific color into several contexts: drop out forms, etc..
Added a new sophisticated Despeckle filter for bitonal images. GdPicture.NET 14.0 helps integrator tackle the document review challenge thanks to the new comment feature. GdPicture.NET based applications can store comments within all formats supported by GdPicture.NET (more than 100) including PDF and TIFF. Thanks to this new feature, these applications can offer collaborative document review as the participants can share information during the review process. Comments support has been introduced by the mean of an update the GdPicture/XMP annotation scheme. Wang annotation is an old and badly documented annotation format. In order to help several customers in trouble with thousands of documents using this deprecated format, ORPALIS has developed tools to convert these old-fashioned files to state of the art annotated PDFs or TIFFs. Benefiting from the latest improvements in GdPicture.NET 14.0, a lot has been done in the inside of DocuVieware 3.0 at several levels to improve performance, memory footprint and, therefore, user experience. The rendering quality of images has also been greatly improved for certain zoom levels and the PDF rendering time has been dramatically speeded up. Data transfer speed between server and client is faster. Format support has also been improved and it is now possible to export a Microsoft Office OpenXML document to vector PDF. Added support for link to URI. Added support for ASP.NET Core Web Applications (.NET Framework). Added link annotation support in built-in annotation palette. The DocuVieware TWAIN Web Connector 2.0 now supports TWAIN acquisition over HTTPS so it does not break the security chain in SSL secured environments. All the security aspect is automatically taken care of during the installation process so it is totally transparent to both the user and developer. DocuVieware 3.0 also allows to programmatically define a default configuration using the corresponding jР°vascript client API methods that have been added. Besides the acquisition settings, you can also choose whether you want the device driver dialog to appear or not, so it is now possible to silently scan documents within DocuVieware and make the acquisition process easier for your end users. In the continuity of the existing annotation system, a new annotations comment feature has been added to GdPicture.NET 14.0 to help integrators tackle the document review challenge. DocuVieware 3.0 provides a new built-in rich user experience Snap-In that allows users to add, remove and edit comments. The collaborative document review process is made easy for everyone thanks to comment statuses and discussion support allowing a user to answer to an existing content. This comment feature is available for PDF and TIFF document but also for all the 100+ document formats DocuVieware supports. Header and footer have been removed when printing in Chrome and Firefox. Page alignment is now centered by default. DocuVieware 3 supports several new languages: Swedish, Norwegian, Finnish, Korean, Slovenian and Hebrew. This increases the number of supported languages in DocuVieware 3.0 to 25. A new set of tutorials is provided to facilitate DocuVieware 3.0 integration in any web technology. Those richly illustrated step by step guides demonstrate how to serve DocuVieware through a REST API and integrate it inside your application using jР°vascript, Angular, PHP, Java, ASP.NET and more. GdPicture.NET 14.0 supports .NET Framework 4 and higher. The software development kit is compatible with Windows XP and higher. The COM/ActiveX edition is now targeting the .NET 4.0 Framework (was 4.5) making it compatible on all operating system since Windows XP. All GdPicture.NET 14.0 features are now available on all supported .NET Frameworks, including Office Open Xml support. Introduced to handle fast document conversion (i.e. Office Open Xml to PDF ). This class is available for the Ultimate edition only. Introduced to fully control any OCR aspect of any document. Includes near than 100 features. GdPicture.NET 14.0.73 (November 07th 2018) Implemented a new adaptive file caching mechanism into the toolkit. Improved PDF rasterizer. Improved MRC engine compression rate and quality of produced documents. Improved 2D barcode reader accuracy. GdPictureOCR: new property EnableVigorousDespeckle. GdPictureDocumentUtilities: new method SetAdaptiveFileCachingMechanism(). GdPictureDocumentUtilities: new method ReleaseAllGdPictureImages(). GdPicturePDF: new method GuessPageTextRotation(). GdPicturePDF: new method SetAnnotationName(). GdPicturePDF: new method GetAnnotationName(). GdPicturePDF: dramatically reduced memory usage while manipulating / cloning documents. Battery of minor bug fixes.